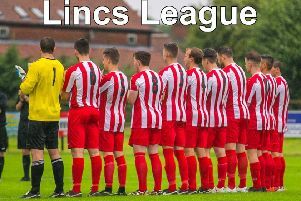 A dominant first-half performance helped Alford Town defeat Mablethorpe 6-3 in the East Lincs Combination League last Tuesday. The first quarter of the match was evenly contested until Mitch Whiley conceded a penalty kick for handball in the area. Michael Limb converted it before things went pear-shaped for Mablethorpe. Minutes later, Jack Wightwick doubled the lead with a neat finish. Almost immediately after the re-start, Wightwick scored again – this time with a delightful chip from long range. It was 4-0 when Nick Hopper headed in a cross by Reece Lovelace. It then went from bad to worse for Mablethorpe as Wightwick completed his hat trick with a good individual goal. Mablethorpe kept going with Alex Carter forcing Andrew White into a save and Whiley going close. Mablethorpe were awarded a penalty early in the second half after Max Billingham was fouled by Kyle Nicholson. Billingham took the spot kick himself and blazed over the crossbar. White came well off his line before the ball was kicked so a retake was ordered. This time Jamie Pittam took it and he also missed, shooting inches wide of the left post. Alford added a sixth goal when Wightwick found Michael Brown with a diagonal ball and he blasted into the roof of the net. At 6-0 down, Mablethorpe suddenly played much better, scoring three goals to make the final score less embarrassing. The first of those was by Danny Marshall who fired in from 10 yards. Five minutes later, Parnell was tripped by Alex Simpson so another penalty was given. Parnell took it that time and sent White the wrong way. Soon afterwards, Parnell raced clear and looked poised to score again until he was chopped down by White. White was dismissed for denying a goalscoring opportunity and Parnell limped off injured. Hopper took over in goal and saved the resulting free kick by Paul Mail. He also saved efforts from Marcus Mackay and Jai Williamson, but was powerless to prevent a consolation by Mail. Andrew Wyer launched a long throw into the danger zone and Mail connected with a header that flew in off the crossbar.